Howdy folks! 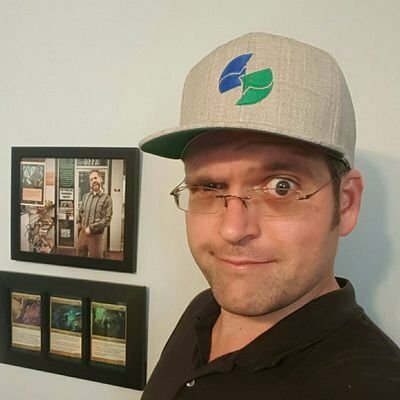 It's Joe again and we're back with another look into the story and substance behind the various decks in the Legacy format! This week we're looking at a deck with a name that's a slight misnomer today, but was more accurate in its early iterations. We're talking about Dragon Stompy! In its basic form, Dragon Stompy is a Chalice of the Void/Ancient Tomb deck that is aggressive and prison-heavy. 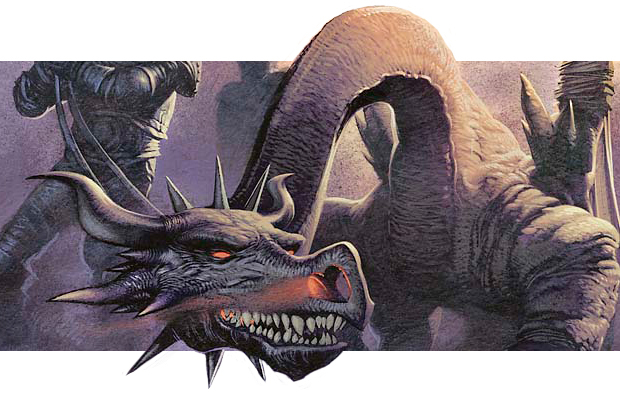 The deck's earliest versions however, created by Leif Whittaker and Billy Zane, and were mostly centered on the strength of Rakdos Pit Dragon. This earned it the name DRAGON STOMPY, and despite the many changes the deck has undergone in the years since, the name has pretty much stuck. While it's obvious now that many of the cards in this deck (the Dragon himself, Gathan Raiders and Arc-Slogger) are no longer significant threats by today's standards, it's important to keep the context of the metagame at the time in mind. Many of the decks that were around at the time were things like Goblins, Solidarity, and Canadian Threshold. As the deck has evolved, it has adopted newer and more powerful threats, and in this day and age generally doesn't even play any Dragons at all in the list, leading many to look at it and go "Why's it called Dragon Stompy?" Well, just remember that we can all thank Rakdos Pit Dragon for that. Now often referred to as "Mono-Red Prison" by some (and what a boring name this is, for what it's worth), Dragon Stompy is classified by several key points. Chalice of the Void and Ancient Tomb/City of Traitors is the beginning of every Dragon Stompy list that exists. Blood Moon and Magus of the Moon are two of the primary effects the deck uses to lock its opponents into not being able to cast their spells. Additional prison effects like Trinisphere and Ensnaring Bridge play a big part in the deck now. The mana curve of the deck tops out at 4 CMC and no greater. With these key points in mind, let's take a look at the sample list. 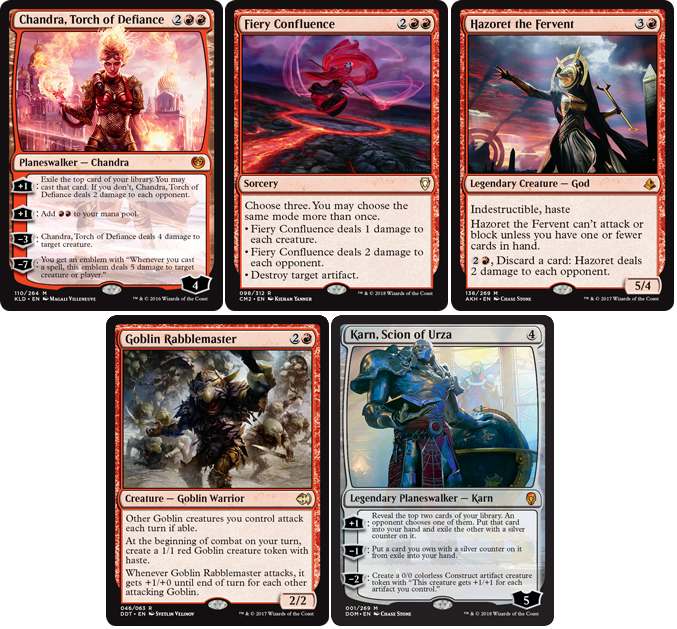 With the releases of Kaladesh and Dominaria, two of the best threats have come in the form of planeswalkers with the cards Chandra, Torch of Defiance and Karn, Scion of Urza. Using Ensnaring Bridge, Dragon Stompy easily locks out opponents from attacking while still using Chandra to push through damage and Karn to dig through their library for better ways to close out the game. Another card with a massive effect on the development of the deck is the card Fiery Confluence. Its versatility combined with sheer strength made it an instant 4-of in every deck. This deck's power is not to be denied. With its bevy of lock pieces and strong threats, it is certainly a force to be reckoned with in a format so reliant on nonbasic lands and 1 drops. These are the cards that make Dragon Stompy tick, primarily. The combination of Chalice of the Void and fast mana such as Ancient Tomb, City of Traitors, and Simian Spirit Guide are among the deck's most important interactions, and what makes the deck a viable competitive option in the format. Between 8 Blood Moon effects, Ensnaring Bridge, and Trinisphere, Dragon Stompy has most of the avenues covered in being able to prevent an opponent from taking certain actions, whether that action is attacking or being able to cast their spells. These are just some of the more common threats this deck often runs, but they are certainly powerful. Chandra's utility + her ability to push through damage is what makes her as strong as she is, and Goblin Rabblemaster interacts favorably with Ensnaring Bridge by making 1/1s that can generally swing under it. Another card that has proven its worth in this deck is Hazoret the Fervent, providing a means to ditch its hand size for Bridge, simultaneously pushing through damage. Since Dragon Stompy's deckbuilding restrictions key it in on casting spells with Chalice X=1 on the battlefield, its sideboard choices are limited to cards that often do multiple things or are modal. Cards like Abrade have been big use in the past few years, with its versatility in providing a choice in how to use the card. Often times, cards such as Faerie Macabre are heavily used due to the fact that they can be activated through a Chancellor of the Annex pre-game trigger and often can't be countered unless it's by a card like Stifle. Another great sideboard boon brought by Ixalan is the card Sorcerous Spyglass, as it is a Pithing Needle-like effect that also gives you ability to see your opponent's hand and what they're playing. What makes it great is that it's the right mana cost at 2 CMC, being able to be cast by Turn 1 Ancient Tomb / City of Traitors or even a Mountain and a Simian Spirit Guide if need be. In addition, Scab-Clan Berserker and similar are powerful hate cards versus fast combo such as Storm since they come down early to be relevant in those matchups. That's all the time we have this week folks! I hope you are enjoying this jaunt into the various decks within the Legacy format. Next time will be a real treat for me, since it's a deck I really enjoy seeing back to a more playable stance since the banning of Deathrite Shaman and Gitaxian Probe. We're going to be looking at a little ditty known as Canadian Threshold, otherwise known as RUG Delver!